You want to issue and/or redeem vouchers for a certain amount of money in Lodgit Desk. First create an extra item "Voucher" in your extras administration (Administration > Extras & Packages). If the voucher is paid cash or with credit card you can now create a voucher by creating a receipt (Administration > Create Receipt). If you want to personalise your voucher you also can add an recipient here. Select and open a booking in which the purchaser of the voucher is a guest. If there is no such booking simply draw a new booking in the Reservation Schedule and add the purchaser as the main contact. Add the voucher to the extra items of this booking (Go to: Services > Tab "Extras/Packages" > Click on "Add extra item" > select "Voucher"). Edit the voucher so it has the correct price and tax rate. Issue an invoice for the voucher via: Button "Invoice" > only drag "Voucher" into the column "items to be invoiced" > issue the invoice. You might have to alter your invoice texts for the voucher (tab "texts" in the invoice-window). If you issue vouchers on a regular basis you might consider adding a language set "Vouchers" to your Lodgit Desk. If you created an booking in step 1, this can now be deleted since the invoice will still be archived in your invoices and also be associated with the guest in the guest-management. In order to follow up on your vouchers it is recommended you keep a list of your vouchers outside Lodgit Desk in a spread sheet (e.g. Excel). When redeeming an issued voucher, you can either use the same extra item as when issuing a voucher, or create a separate extra item according to the same pattern. 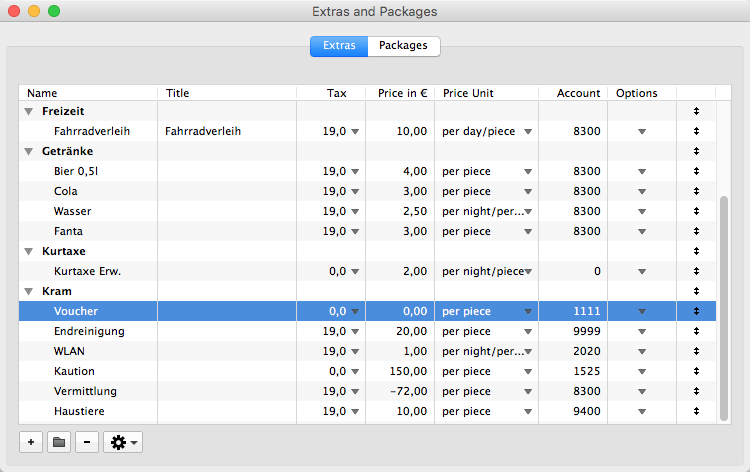 Then add the extra item to the booking and enter the corresponding data (negative value, value-added tax of the voucher). When the invoice is created, the entire booking is then settled normally.